Made in the U.S.A.Fits all full size vans. Heavy guage steel partitionwith steel door pillar mounts give maximum protection from shifting cargo. Three bolt together sections for rigid strength. 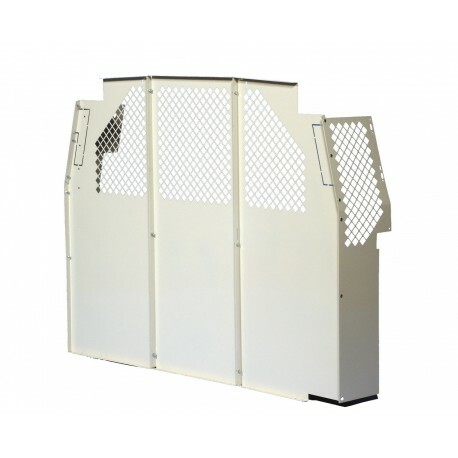 Full diamond punched top and passenger return allow maximum visibility. Dimensions: 51.5"H x 67"W. Comes complete with all assembly and installation hardware, brackets and easy to follow instructions. Contoured shape fits neatly along van wall to provide driver and passenger protection as well as security for your equipment. Powder coat off-white finish reflects more light in your vehicle tosee better.